It's been five years since the St. Paul football team last played in the 1A playoffs, but they're beginning to feel right at home after defeating the Wallowa Cougars 46-16 in the semifinals on Saturday to advance to this week's state championship game in Hillsboro. It was the Buckaroos' (12-0) second victory of the season over the Cougars (9-3), who they hosted on Aug. 31 in their first 1A game since 2013. The two teams opened Saturday's semifinal contest played at Hermiston High School evenly matched. The Bucks struck the first blow, starting their second drive near midfield and converting an 18-yard pass from T.J. Crawford to Alex Dela Cerda for the game's opening score. The Cougars couldn't answer on the ensuing drive after being held to three-and-out, but got a break on a fumbled punt return by St. Paul to retain possession near the red zone. 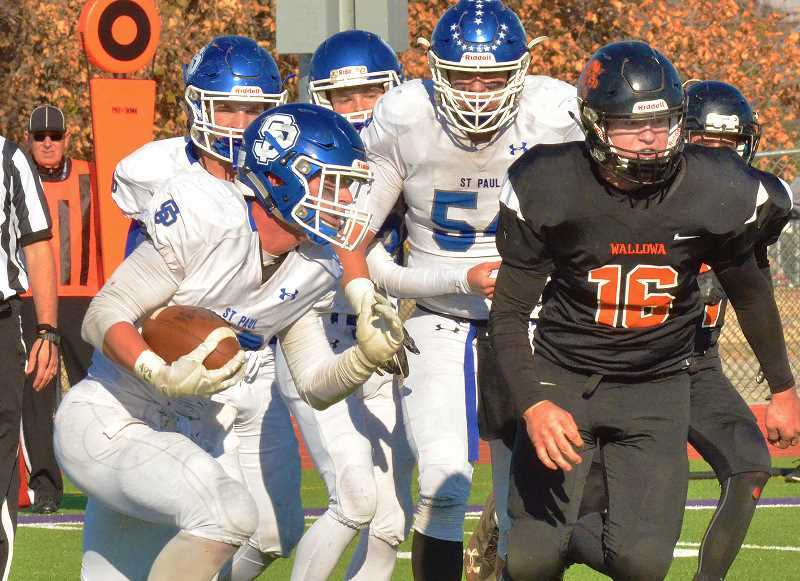 Wallowa didn't need a third chance, moving down to score on a 5-yard pass from Gus Ramsden to Wyatt Prince to tie the game at 8-8 early in the second quarter. But from there on, the game belonged to St. Paul. The Buckaroos answered on their next drive, picking up five first downs before scoring on a 12-yard run from Justin Herberger to retake the lead. St. Paul shut down Wallowa at midfield on the next possession and fired a 55-yard touchdown pass from Crawford to Jaidyn Jackson to make it a 24-8 game going into the half. St. Paul came out of the locker room slinging the ball once more, as Crawford found Dela Cerda for a 68-yard touchdown pass on the opening drive. The Bucks failed their first two-point conversion attempt on the next play, making it a 30-8 advantage. Wallowa's next drive was cut short after two plays on a fumble forced by Rawley Koch that was recovered by Francisco Vargas-Ayala. St. Paul chewed up the remaining eight minutes of the quarter on an 86-yard drive that culminated in a 17-yard touchdown pass from Crawford to Jackson to put the team up 38-8. Another short drive by the Cougars led to one last scoring drive by the Bucks, once again on a Crawford-to-Jackson connection, this time for 17 yards. With the score at 46-8, Wallowa ripped off a quick 80-yard drive for their second score of the game with 3:32 remaining, wrapping up the action. St. Paul ground out the final few minutes, putting an end to the Cougars' strong season. Led by Crawford's dual threat ability behind center, the Bucks racked up 559 yards of offense in the game. Crawford was 12-of-15 in the passing game for 242 yards and five touchdowns to go along with 102 yards on the ground. Jackson led the team with six receptions for 115 yards and three touchdowns, while Dela Cerda added three catches for 98 yards and a pair of scores. Herberger led the way on the ground, carrying the ball 34 times for 222 yards and a score. St. Paul has ran — and passed — roughshod over their competition for the past three months, carving a swath through the regular season and the playoffs all the way to the 2018 1A Football State Championship game. They will face the three-time defending 1A state champion Dufur Rangers (12-0), which is the only other team in the classification to match St. Paul's gaudy numbers this season. St. Paul ranks No. 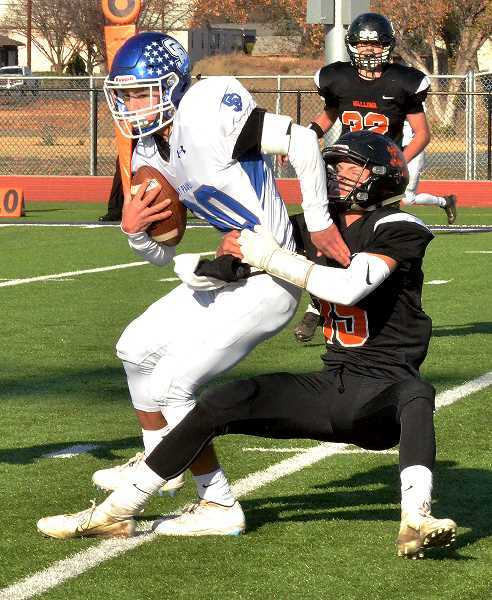 1 among 1A teams in both offense (63.2 points/game) and defense (13.5 points/game), while Dufur is No. 2 in each category with 54.0 points scored and 13.9 points allowed following a 46-0 romp over Hosanna Christian in their semifinal game. This will be the fourth time in OSAA history where St. Paul and Dufur have played each other for a 1A football title. St. Paul previously beat Dufur 38-36 in the 1992 championship game. But the Rangers got revenge less than a decade later, defeating the Bucks 56-38 in the 1999 title game and 30-8 in the 2001 championship. This will be the 14th championship game in program history for the St. Paul football team. The Bucks are 6-7 in the state title game, with their last win coming in a 22-8 win over Camas Valley in 2010. The 2018 1A Football State Championship game will be held at Hillsboro Stadium at 11 a.m. on Nov. 24.